Oil gilding is more usually done with metal leaf, an alloy of copper and zinc, not so fragile as gold leaf but also not so permanent. It is produced in much larger sheets and looks more like fine gold foil. Using this method the metal leaf (also called Dutch metal or Schlag leaf) can be applied directly by hand onto the sized wood, without first having to prepare a gesso surface. 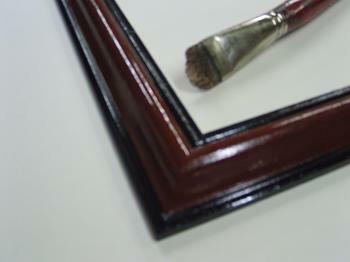 In this particular case, the frame has first been painted black and red/brown before being oil gilded, as a base for a painted finish.